Don't cry for me Argentina … unless I never had a chance to visit you. As the second largest country in South America [and sixth in the world], it has four seasons and enough variety of ecology, culture and activities to satisfy most any traveler. Since we arrived in August, and had no interest in skiing, spending time in Patagonia was bypassed for a longer stay in Buenos Aires and Iguazu Falls. Argentina was experiencing a colder than usual winter, and just a few weeks prior to our arrival, it snowed in Buenos Aires for the first time in ninety-seven years! We stayed at the Hotel Paname-ricano which was across from the Obelisco, a sixty meter high monument, built in the thirties, where people come to celebrate sports or political events. The Panamericano is a five star hotel with an excellent and attentive staff who were very helpful in assisting us in navigating the city. It is centrally located and near the famous Florida Street where the shopping is easy and the cars are banned. 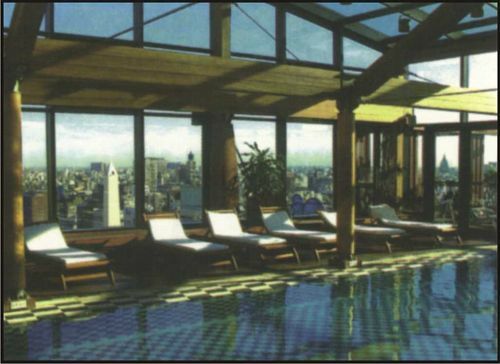 It has a spacious lobby but the real attraction is the rooftop health club and indoor pool from which one has a spectacular panoramic view of the city. We enjoyed the extensive buffet break-fasts and afternoon coffee breaks in their lounge, made all the more tasty with an assortment of complementary chocolates. In fact our most memorable dining experience was at the renowned Restaurant Tomo 1 which has been in the hotel for years. First class service and first class cuisine make this dining Mecca second to none. 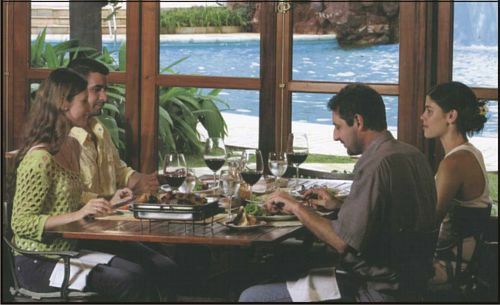 Check out their menu at www.tomo1.com.ar and learn more about the hotel at www.-panamericano.us. How about kosher food choices you may ask? The answer is as easy as www.mapakosher.com.ar. It will tell you places to eat, such as a kosher McDonalds, as well as Jewish sections of Buenos Aires and synagogues. Argentina has one of the largest Jewish communities in the world, and the flag of Israel is visible on the facade of several buildings. One of our cab drivers spoke to us in Yiddish [which was barely better than our Spanish], and told us that his family came to Argentina from Warsaw, Poland. There is, in fact, a European ambiance in this city that is not surprising as so many of its inhabitants emigrated from that area. Buenos Aires is referred to by many as the Paris of South America. There are several different neighborhoods in Buenos Aires to explore. 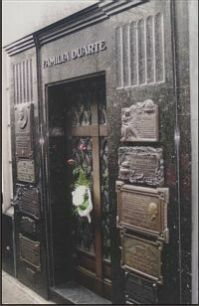 The Recoleta section is best known for its Cementario de la Recoleta, the burial ground for the rich and famous, as the nation's great leaders are buried there. 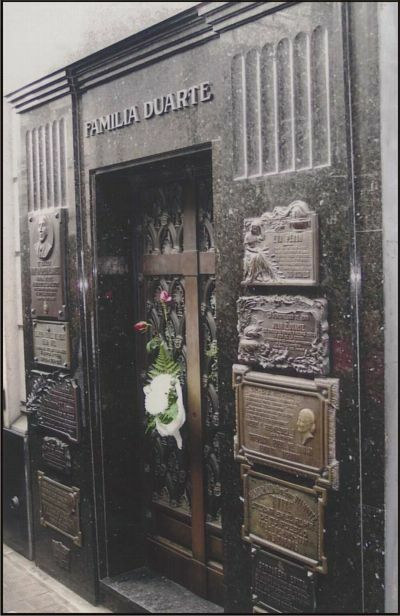 One of the most visited tombs [under the name of Duarte Familia] is that of Eva Peron. The architecture of the mausoleums is quite elaborate and reflects the wealth of the families buried within them. It is suggested that you have a guide or purchase a map to appreciate the history of the cemetery. 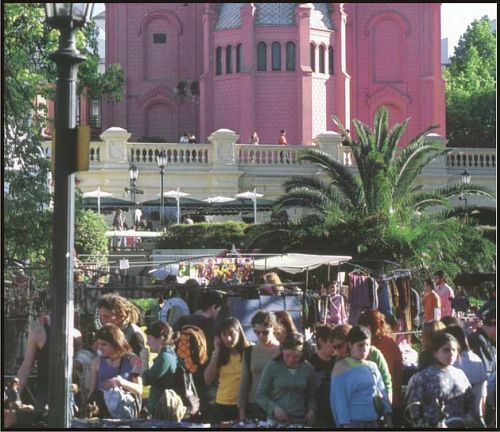 Recoleta is also known for its parks, variety of restaurants, and for its flea market which is held on the weekends. The place to go for a delicious dinner is Puerto Madero, a waterfront neighborhood that is undergoing a vibrant transformation with the construction of upscale restaurants and housing. We found the food to be consistently good. Interesting boutiques and restaurants are plentiful in the San Telmo area, Argentina's equivalent to New York City's Greenwich Village, where artists and intellectuals reside. A major event is the Sunday flea market in the central plaza where one can find a large selection of handmade leather goods and jewelry. We ventured back to San Telmo one evening to attend the La Ventana Barrio de Tango show [www.la-ventana.com.ar]. One must not leave Buenos Aires without a Tango experience. In addition to the sensual tango dancing there were gauchos and performers in native dress entertaining us with music and twirling bolos. The Italian influence is strong in La Boca, which is famous for its brightly colored houses made from sheet metal. It is also known for its Boca Junior soccer team - a sport that is a passion for Argentineans. If you have a chance to see them play, hopefully against their rival, River Plate, do not hesitate to do so. In order to get a sense of the city it is suggested that one take a city tour. One company that combines video displays in addition to a description of the various areas by their guide in both English and Spanish is Opcionsur [www.opcionsur.com.ar]. The tour is well worth the $30 charge. From Buenos Aires, there are several side trips that can be arranged. We visited the town of Tigre, situated at the mouth of the delta, which is especially popular during the summer months for the water activities offered. A trip to a gaucho ranch where one can observe the life of a cowboy is another popular attraction. 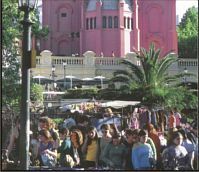 For assistance and suggestions there is a well established company specializing in Argentina tourism that can help arrange the ideal side trips at www.argentinain-coming.com.ar. Even though the economy of Argentina has improved over the last several years, the American dollar is still strong, and one can get great bargains in leather goods, silver and certain gems. We had leather jackets custom made at a cost of a little more than $100 each! While there are many places to shop for these items, we felt comfortable staying away from the "factories" and perusing the popular shopping districts. One shop that impressed us with its service, selection and tailoring was Guns Leather at 658 Florida Street [gunsleather@-yahoo.com.ar]. After several days in Buenos Aires, we took a ninety minute flight to Iguazu Falls, the spectacular waterfalls that divide northern Argentina and southern Brazil. 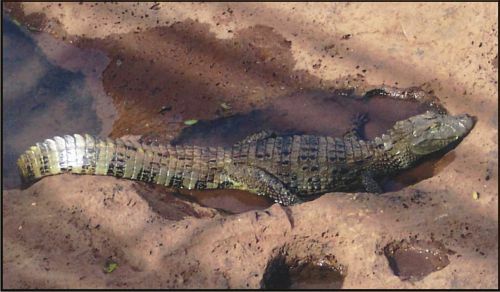 We stayed at the luxurious Iguazu Grand Hotel Resort & Casino, which, deservedly, is a member of the Leading Small Hotels observed tropical birds, raccoon-like coatimundis and several caymen [resembling crocodiles] basking on the rocks in the river. There were many vantage points from which to observe the Falls. The most spectacular was the Devil's Throat where you could see the powerful force of the Falls up close, feel the spray on your face, and hear the thunderous sound of the gushing water! 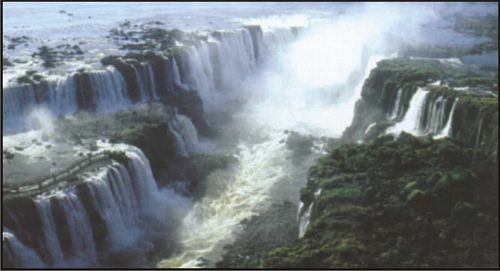 Some people may want to view the Falls from the Brazilian side for a more panoramic view; however, there are extra costs, visas and time required that may be better spent seeing other parts of the Missiones section of Argentina which, regrettably, we did not have the opportunity to see. This area may be too oppressively hot to visit during the summer months of January and February, as the temperature and humidity index can make it quite uncomfortable. Argentina is an excellent travel choice. The people appreciate Americans. The US dollar goes far which is always good news for American travelers. Plus, there are many areas beckoning the adventurous explorer … so if that description is what you are looking for, then let your fingers do the walking to www.tu-rismo.gov.ar to begin your adventure.